The TC400-PAN-TDM from Dolgin Engineering features integrated battery plates that support Panasonic and third-party VW-VBD58, AG-VBR59P, AG-VBR89G, AG-VBR118G, CGR-D54, and CGA-D54 batteries. These batteries are used with Panasonic's DVX200, PX270, HPX170, and HVX200 cameras. 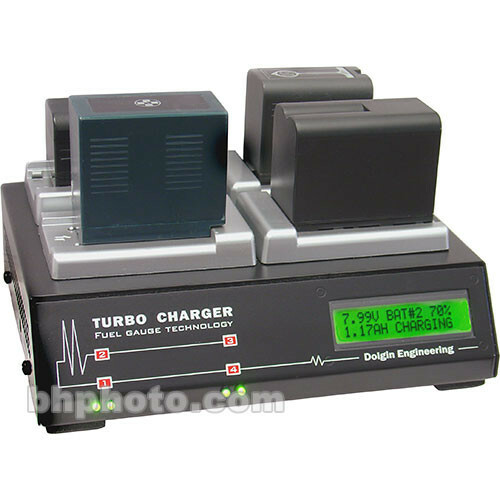 The TC400-TDM has an LCD screen on the front panel that displays charge status in volts, amp hours, and percentage of charge that's estimated using a proprietary algorithm. The TC400-TDM is also designed with a built-in Test/Discharge Module that allows you to determine whether a battery is new or old, and whether it's on par with its label. The TDM feature cycles the battery (fully charges and discharges it) and then provides a report on its capacity. The TC400-TDM has fully independent channels and provides simultaneous charging to all four batteries. Based on a capacity of 5600mAh, this particular model delivers a complete charge in approximately 3.5 hours for four batteries or when you charge a single battery. The charger comes with a U.S. power cord and supports worldwide power input via optional plug adapters, as well as 12 VDC car lighter power via an optional car lighter adapter (model # DE_CAR_12).